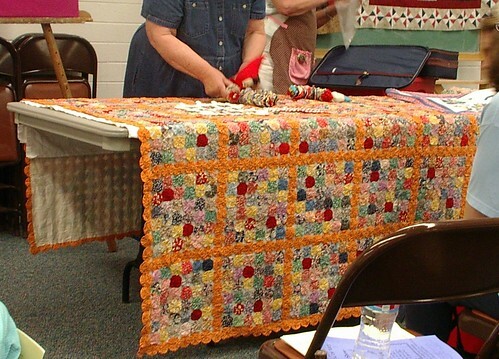 There was a second class I went to during the quilt fair and wished I had not. The class was titled "What to do with all those yoyos". So I thought hey might be fun to see someone else's ideas other than my own. 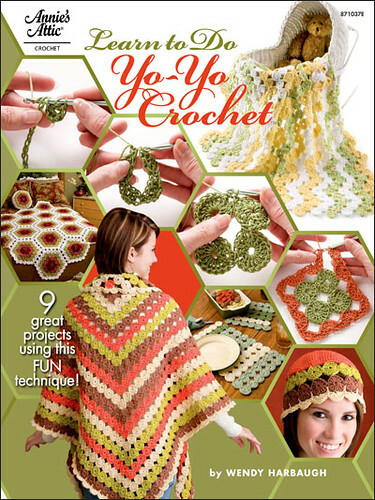 The booklet stated that the teacher had been making yoyos since she was six years old, she is in her 70's or 80's. At the start of class, I was early for this one, I asked if I could take photos while they set up. The lady at that time said" oh I remember you, you are who we thought of when we decided to make this lecture but didn't know how to get a hold of you". So they asked someone else. I was good with that I wasn't into the teaching mode I was in the hang out with daughters and have fun at the fair mode. 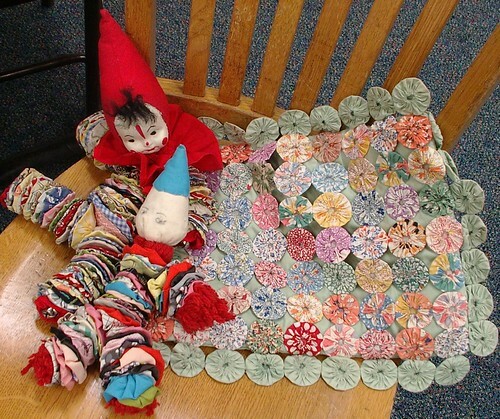 I asked a few questions and discovered the only things the teacher had made was the pillow when she was six years old a small yoyo quilt (very pretty I might add) and had 2 half done projects one the quilt with the baskets full of yoyo flowers and the other was a kids t-shirt with five yoyos pinned to it. To look like balloons so she told us as she had not sewn down the yoyos yet or embroidered the balloon strings yet. So it just looked like a bunch of yoyos with pins in them on a red tee. I am not trying to be critical of the lady she is a very nice and a dear friend of mine. But it was not her day nothing came out the way she wanted too she even messed up showing us how to make a yoyo she forgot to fold in her seam allowances, nerves. It got worse from there I so wanted to rescue her nothing like going down in front of a 70 woman who all know how to make yoyo's. How do I know we all knew how to make yoyos the teacher asked who had made yoyos before pretty much everyone raised their hands. Then asked why are you here then we all answered this isn't supposed to be a class on how to make yoyos but how to use them as embellishments. I think that was the start of the down fall and the second was the oops on the yoyo demo a few moments later. I so wanted to rescue her. Bless her heart she did her best she stood in front of everyone for an hour trying to get through her demo from loosing her needle to breaking her thread and with 3 or 4 ladies falling asleep in the back of the room and snoring. I have never seen a person try so hard to get through a demo as she did. I think she should get an award for perseverance. 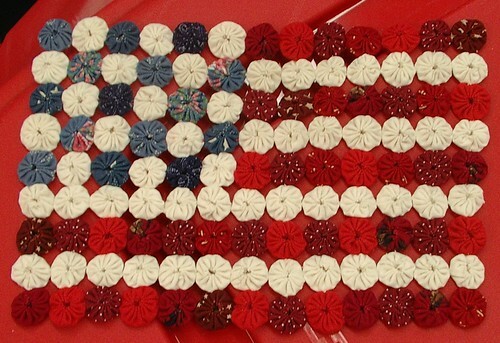 This was made by the friend of the teacher and my friend too Seiko Higgins. She is the person who taught me how to make yoyos years and years ago. 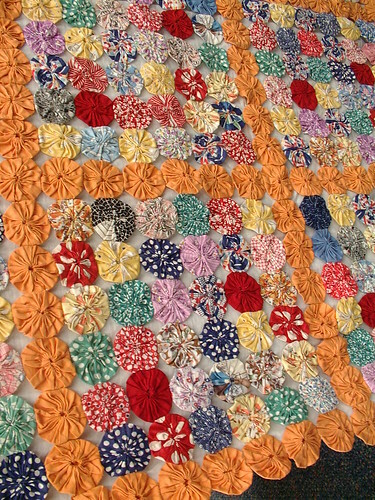 I have a mini quilt made by her too, mine is in purples and blues. I don't have a size reference in the photo but those are smaller than a dime and she did them by hand with out clovers tools. One yoyo clown was made by the teachers brother,the one with the cloth head and missing an arm. 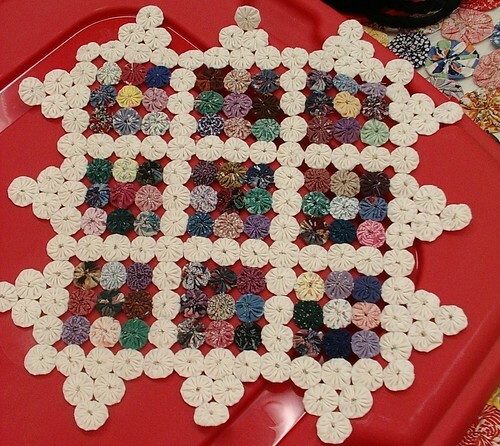 It was made when the teacher was a little girl. The other was found thrift shopping. The pillow she said she made when she was 6 years, when she had rheumatic fever. Those are not reproduction feed sack material those are the real thing this was made when that was new. This one was made by the teacher it is 1/2 done. This one was made by the teachers daughter. 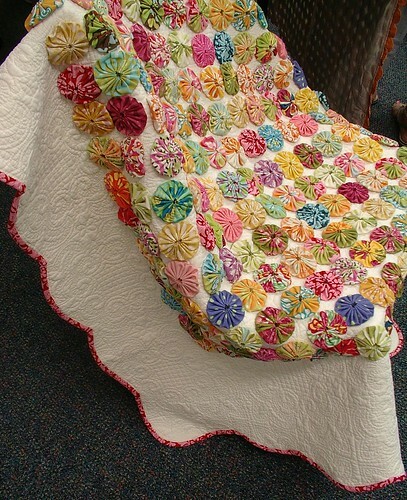 She bought a 20 dollar quilt at TJ Max a place like Ross's and embellished it with the yoyos. Cute idea and quick. 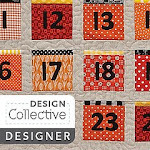 I love that she went back and added her own seam binding to the already bound quilt to pull it together. It is a nice finishing touch. Oh and I love the colors. 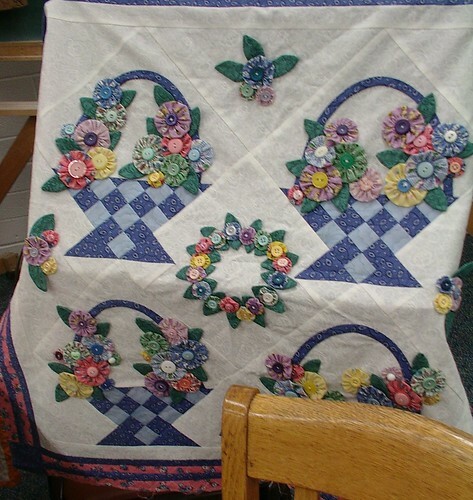 Vintage quilt made by the teachers mother I think I am not sure on this one but I know the teacher didn't make it. Sewn onto a white cloth backing to reinforce it and make it stronger. I love the colors in this one too. A very nice collection of vintage feed-sack material could look at it for hours just to find out how many fabrics are in it. Oh, I REALLY like the one with the baskets and the yo-yo flowers! SEW cute! I wanted to let you know that I'm having a giveaway! Be sure to come on over and join in! Oh my heart went out to that little old lady. And I can understand you itching to be able to help. 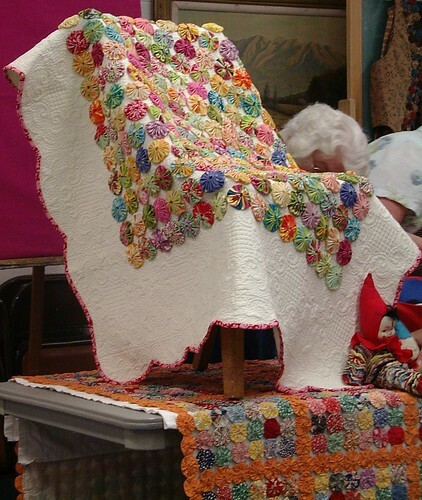 The things she has made are very pretty though. Particularly the flowers baskets. Oh what gorgeous pieces. Its too bad the demo went so badly! One year I made everyone yo yo pillows for Christmas. I wish I had made myself one too! I wonder if I have a picture of them somewhere. I have an old unfinished top that needs a lot of repairing that belonged to my step dad's aunt. It's mostly made out of polyester material.